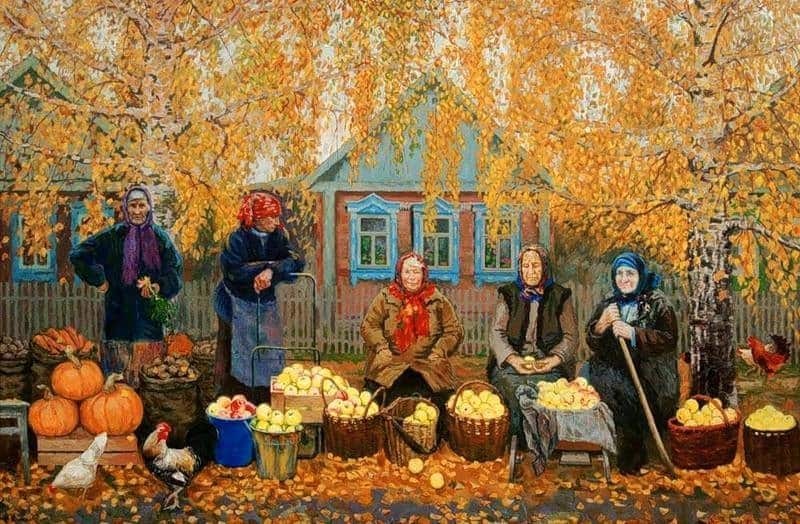 I like this picture because it conjures up happy memories of being driven through the Russian or Ukrainian countryside and seeing this sight in every village – old ladies sitting on benches outside their houses, alongside the main road. Maybe with some garden produce for sale, maybe chatting with their friends but often just sitting on their own, watching the world go by. I remember thinking I should like to do that in my old age, but I don’t think it would work where I live, on a side-street in the London suburbs. Yes, this painting reminds me how many ladies I saw last August selling mushrooms and berries, when I visited in Russia’s Carelia. I don’t see any Finnish ladies sitting roadside and selling products they have picked from our forests. We Finns still go forests after berries and mushrooms, but very few sell them. If someone sells them, they sell them for wholesale buyers. I think that it is pity, because I would like to buy them from local people fresh.